The R/H SABVABAA is a 13m Griffon 2000TD Mark III hovercraft equipped for marine geophysical research from the Arctic ice pack. It has accommodations for 2-4 people. Its equipment includes 12/200 kHz echo-sounders, CHIRP sub-bottom profiler, 60 m streamer and air-gun sound source. A hydraulic winch with 4000 m Kevlar rope allows coring with a 2 m hydrostatically boosted corer, dredging, and bottom camera work. An ADCP and CTD on a light hydraulic winch with 500 m of single conductor cable are available for oceanographic casts. An electromagnetic probe samples the ice thickness forward of the craft every 2 sec. Two autonomous drifting buoys for seismic profiling are under development, along with simpler systems for echo-sounding and possibly CHIRP profiling. Signals are sent to shore via Iridium satellite communications. This talk will highlight the first two summers of work on the icepack over the Yermak Plateau, north of its winter home in Longyearbyen, Svalbard. Our website at http://www.polarhovercraft.no gives additional information. John Hall received his Ph.D. from Lamont in 1970. His thesis involved geophysical mapping of the Arctic Ocean from Ice Island T-3 (Fletcher's Ice Island). 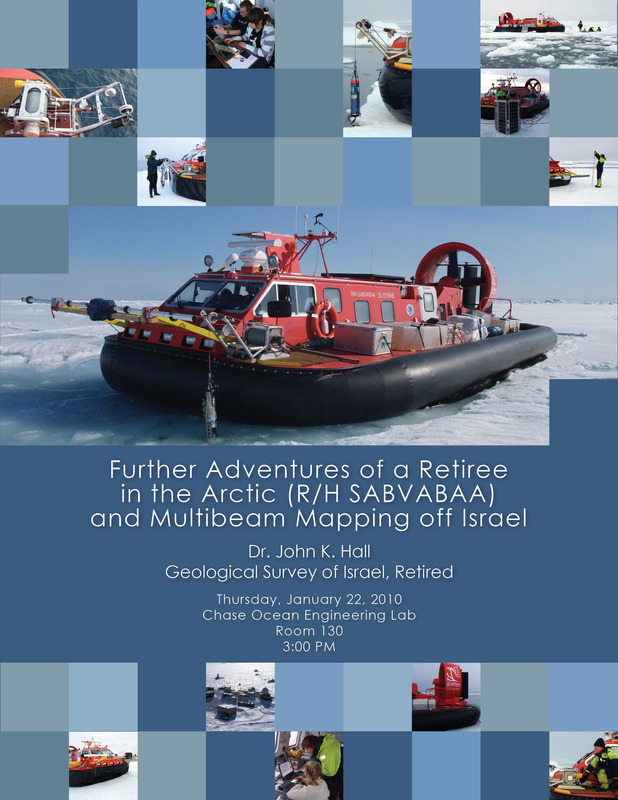 Upon graduation, he moved to Israel and spent 35 years with the Geological Survey of Israel. In 2003-2004, he was a Visiting Scholar at CCOM. During this time he became reacquainted with the Arctic and has participated in CCOM's UNCLOS cruises in 2003, 2004, 2008, 2009, and 2011. While at CCOM in 2004, he partnered with Prof. Yngve Kristoffersen of the University of Bergen and CCOM in the building and equipping of a research hovercraft to carry out oceanographic, geological, and geophysical investigations. This platform offers a relatively inexpensive way to carry out research in the most inaccessible parts of the Arctic Ocean. The particular target is the study of a possible asteroid impact zone on the Alpha Ridge north of Ellesmere Island, site of the oldest cores thus far raised in the Arctic.